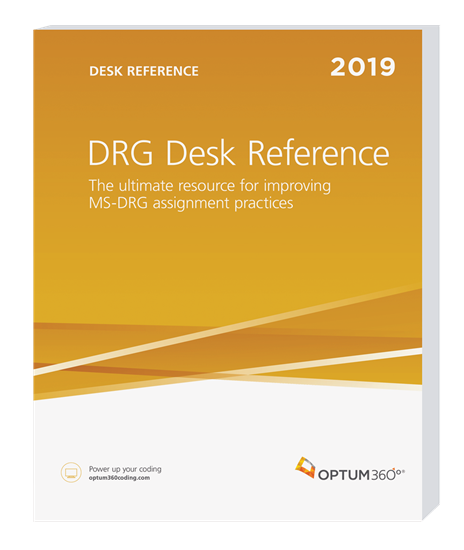 With the implementation of ICD-10 codes in October 2015, the 2019 DRG Desk Reference(ICD-10-CM) gives access to crucial information to improve MS-DRG assignment practices, guidance on how to accurately assign DRGs under the MS-DRG system, and focuses on the Optimizing section of the DRG Desk Reference based on ICD-10 codes. The DRG Desk Reference(ICD-10-CM) is designed to work hand-in-hand with DRG Expertand the Guide to Clinical Validation, Documentation and Coding, which is the clinical section from the DRG Desk Reference based on ICD-9 codes. This product is needed to answer all your DRG questions for all inpatient stays starting after October 1, 2018, as those claims will use the MS-DRG methodology based on ICD-10-CM. Optum360 Edge—Optimizing tips. Know the major factors involved in moving a patient from a lower-paying MS-DRG to a higher one to receive optimal payment while staying in compliance. Optum360 Edge—Recovery Audit Contractor (RAC) program resource. Understand the types of reviews, target strategies, and targeted and top-audited DRGs. Most commonly missed CC and MCC references. Perform accurate audits by knowing the most commonly missed CCs in the medical record. ICD-10-CM codes for common diagnoses and procedures. Quickly identify the key diagnosis or procedure by ICD-10-CM code. Case mix index section. Discusses the importance of calculating and tracking case mix on a regular basis as well as tips for documenting case mix index changes and their causes. Complete CC and MCC list. Know how codes considered MCCs and CCs will affect DRG assignment—helping to legitimately improve reimbursement. Relative weights of every valid DRG. A quick reference of the relative weights of all DRGs presented as options for optimizing. List of ICD-10 codes driving MS-DRG assignment.